A 26-year-old Caucasian female was referred to our Gastroenterology Department for management of an asymptomatic pancreatic mass incidentally detected during a genitourinary ultrasound performed for acute right iliac fossa pain. She reported smoking habits but denied alcohol consumption. Her past medical history and physical examination were unremarkable. Laboratory investigations showed mild normocytic and normochromic anemia (Hemoglobin 11.2 g/dL); total white blood cells count, erythrocyte sedimentation rate, C-reactive protein, liver tests, CA 19.9 and CEA were normal. Endoscopic ultrassonography (EUS) revealed a homogeneous, hypoechogenic and well-defined solid lesion, with 11 mm of greater diameter, in the pancreatic tail (Figure 1A). This lesion showed no vascular pattern on Doppler examination. Contrast-enhanced EUS confirmed a hypovascular lesion (Figure 1B). Elastography showed intense blue coloration (Figure 1C). There were no pancreatic calcifications and common biliary duct, pancreatic duct and splenoportal axis were normal. EUS-guided fine needle aspiration (FNA) was performed with a 22-gauge needle (Figure 1D). 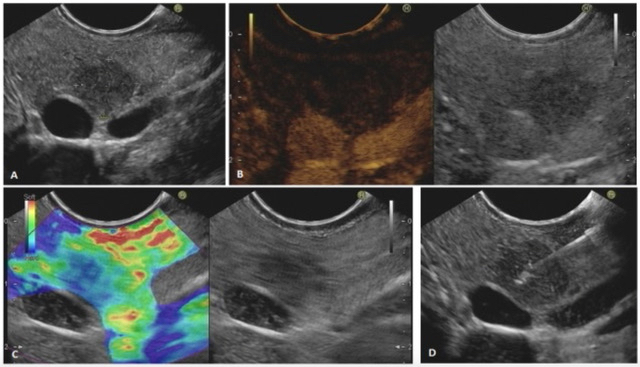 Figure 1: Imaging findings on EUS – (A) Homogeneous and hypoechogenic solid lesion in the pancreatic tail; (B) Hypovascular lesion on contrast-enhanced EUS; (C) Blue coloration on elastography; (D) EUS-guided FNA. EUS-guided FNA cytological analysis was suggestive of pappilary neoplasm (Figure 2A). The abdominal magnetic resonance imaging (MRI) findings were consistent to those of the EUS and no liver lesions were detected. The patient underwent a distal pancreatectomy and the histopathological examination revealed a solid pseudopappilary pancreatic tumor (Figure 2B), positive for vimentine and beta-catenin and negative for chromogranin and synaptophysin on immunohistochemistry. Solid pseudopappilary tumors (SPT) of the pancreas, first described by Frantz in 1959, are uncommon, accounting for 0.17-0.27% of all pancreatic neoplasms1, and represent enigmatic tumors which etiology, prognosis and natural history are unknown. Pancreatic SPT primarily affects young females with a reported mean age between 25 and 38 years2. These tumors can be found anywhere in the pancreas as an incidental finding or present with a nonspecific clinical picture, including abdominal pain, pancreatitis, jaundice or a palpable mass. Most of pancreatic SPT exhibit a benign behavior. In 85% of cases, the tumor only interests the pancreas, while the others 15% may present peritoneal, liver, lymph nodes, spleen and colon metastasis. EUS or MRI, typically reveal a well-circumscribed and heterogeneous mass with varying solid and cystic components, generally demarcated by a peripheral capsule and occasional calcifications. The key histological hallmarks of SPT are solid and pseudopapillary proliferation of monomorphous cells without increased mitosis or cytological atypia3. Immunohistochemically, SPT include positive staining for beta-catenin, vimentin, progresterone receptor, CD56, neuron-specific enolase, CD10, cyclin D1 and, more recently, negative membranous E-cadherin4. Surgical ressection is the treatment of choice, and its prognosis is excelent, with an overall 5-year survival close to 97%. Dong DJ, Zhang SZ. Solid-pseudopapillary tumor of the pancreas: CT and MRI features of 3 cases, Hepatobiliary Pancreat Dis Int, 2006, 5(2):300–304. Papavramidis T, Papavramidis S. Solid pseudopapillary tumors of the pancreas: review of 718 patients reported in english literature, Journal of the American College of Surgeons, 2005, 200 (6): 965-972. Kosmahl M, Seada LS, Dieter-Harms UJ, Kloppel G. Solid pseudopapillary tumor of the pancreas: its origin revised. Virchows Arch A Pathol Anat, 2000; 436:473–80. Lai HW, Su CH, Li AF, Wu LH, Shyr YM, Chen TH. Malignant solid and pseudopapillary tumour of the pancreas: clinic-histological, immunio-histochemical and flow cytometric evaluation. Hepatogastroenterol, 2006; 53(68): 291–295. 1. Gastroenterology Department, Hospital São Bernardo, Setúbal, Portugal. 2. Gastroenterology Department, Hospital Clínico Universitario de Santiago de Compostela, Spain. Submit your own US Quiz!